At Kuebix, we believe all shippers should have the ability to rate, book and track freight directly with their carriers for free. Logistics technology innovator Kuebix today announced Kuebix Shipper, the industry’s first free, multi-mode transportation management system (TMS). Kuebix Shipper gives logistics managers a free solution for unlimited rating, booking, tracking and management of shipments across LTL, truckload and parcel carriers. Now, shippers of all sizes can get the power of a TMS that was only available to larger enterprises in the past. The free TMS enables logistics managers to be up and running in minutes with direct access to their negotiated carrier rates and the ability to take advantage of the vibrant community of carriers offering spot/volume quotes for specific shipping needs. Kuebix expects tens of thousands of shippers to take advantage of this free technology, building a massive global community where Kuebix can efficiently help the industry match capacity to demand across supply chains. This free, cloud-based TMS provides businesses invaluable freight intelligence to quickly reduce their shipping costs and regain time being wasted chasing carriers for rating and tracking information every day. Kuebix Shipper returns the power to the shipper, providing every business a long-awaited alternative to outsourcing business-critical functions to third-party logistics service providers or using resource-intensive manual processes. Leveraging Salesforce’s Force.com platform and other leading cloud technologies, the free Kuebix Shipper TMS enables logistics managers to get up and running in a matter of minutes. 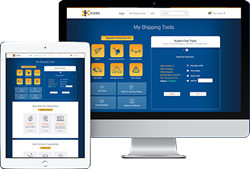 Kuebix has invested heavily in building a complete library of web service integrations to all the major North American carriers allowing Kuebix Shipper users to begin shipping faster than with any other TMS on the market today.